April is National Stress Awareness Month! What a way to celebrate spring, right?! Maybe not, but we’d all agree, we experience stress every day. So what’s the solution to stress? Popular opinion says the ideal life is stress-free, but we know that’s not the message of the gospel. Jesus didn’t come to eliminate stressful experiences, He came to save us from the destructive ways in which we try to address difficulty. One way to increase your ability in coping with stress is to increase your emotional intelligence, or emotional IQ. A high emotional IQ is marked by a person’s awareness of self, as well as a keen ability in navigating their emotions, and the emotions of those around them. In other words, those who have higher emotional intelligence experience less stress, because they’re better equipped for healthy stress responses. Stressors have less negative impact on their emotional and physical well-being. 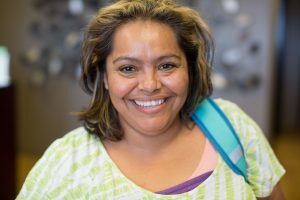 Hope Women’s Center creates a safe environment within each of its centers so women and teen girls can heal past trauma, boost emotional IQ, and work through a present crisis. But another big piece of emotional health is supportive relationships. When a person is strong in both emotional IQ and solid friendships, the impact of stress on her well-being is significantly less. A faithful client for several years, D had formed a strong support network with other Hope clients. So when her husband left her and the divorce displaced D and her children from their home, H invited D and her children to stay with her, extending her hospitality further by watching D’s children so D could work and save for a place for her family. As a single mom, D needed to work, and her employer saw his advantage. He began harassing D, and her emotional struggle deepened. But D was resilient. She didn’t react in anger, she acted in wisdom, turning to her mentor for extra encouragement. D’s mentor worked with her on confidence building, standing up for herself, and verbalizing her boundaries. It worked, and D’s employer has been leaving her alone! Stress and growth aren’t opposing forces, they’re conditions for development and flourishing. That’s why our mission at Hope is equipping women to flourish, despite stress.